As the eldest grandson of the inventor of the Ross Root Feeder, I set out to take my grandfather's vision to the next level. From 1976 to 1990 I worked at the family company until it was sold. I have stayed closely-tied to green industry. My grandfather, father, and my uncle groomed me to become a principle of Ross Daniels, Inc. I traveled the country and then the world, marketing our Ross Root Feeders and Plant Food to the lawn and garden industry. My grandmother Ethel, who was in charge of public relations, told me that this tool was an answer to a nurseryman's prayer, training the roots of trees, evergreens, and rose bushes to seek nutrients down deep in the ground. It also helped aerate the soil as well as save water. During my college years, I spent a summer with a family whose patriarch, Adolf Horstmann, bred the 'Adolf Horstmann' hybrid tea rose. I speak fluent German and learned about European gardening culture with respect to ecological-friendly practices, allotment gardening, kindergardening, and the Waldorf philosophy of gardening. About ten years ago, I began exploring the nature of my own Judaic roots. During that time, I visited the Dachau concentration camp near Munich. In this open air horrific echo chamber, the piercing sounds of the mockingbirds from the surrounding trees made a lifelong impression on me. To this day the ringing is still in my ears. It was as if these birds were heaven sent, telling us that we still have much to do to promote peace in the world. Against this backdrop, I was trying to envision one global, simple vision that could counteract all of the negativity in the world. I was inspired by Dr. Martin Luther King, Jr's "I Have a Dream" speech. After researching the ecological, educational and cultural roots of gardening and contrasting them against our deepest Judeo-Christian-Islam roots, I conceived the Weed Out Hate initiative, a grassroots campaign for engaging our kids in social inclusion gardening games, teaching them to pull, root out, and compost weeds of hatred together, and then replenishing the earth with sunflower seeds of peace. "Gardening is an activity that knows no borders or cultural separations. We just need to agree upon a common symbol. After eight years of research and analysis, I have come up with the ideal campaign slogan: “Weed Out Hate”. This will become our global clarion call to action . . .
. . . Just imagine billions of children extracting billions of weeds. Think of the holes and then think of the opportunities to plant billions of sunflowers, ones that would not only help cleanse the ecology of the planet, but help to cleanse our inner garden as well . . .
. . . Then, we would all experience something really new—a fabric of society that would exist to capture and redistribute all of nature’s bounty throughout the matrix of community gardens in our schools in our neighborhood subdivisions and in our parks throughout the world. The freedom to pursue this kind of connection with nature would be woven within humanity’s most fundamental human spiritual rights: the freedom to experience nature’s ultimate love, grace, and altruism. This is a marvelous goal and one worthy of fighting for . 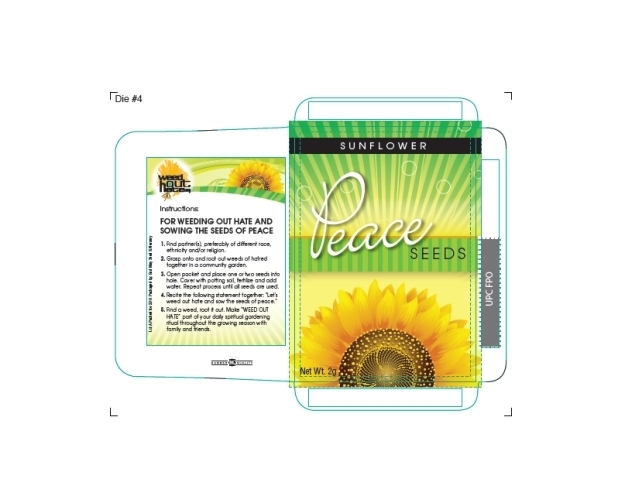 . ."
In August of 2010, I started the Weed Out Hate Initiative and began distributing Sunflower Peace Seed Packs to school children. 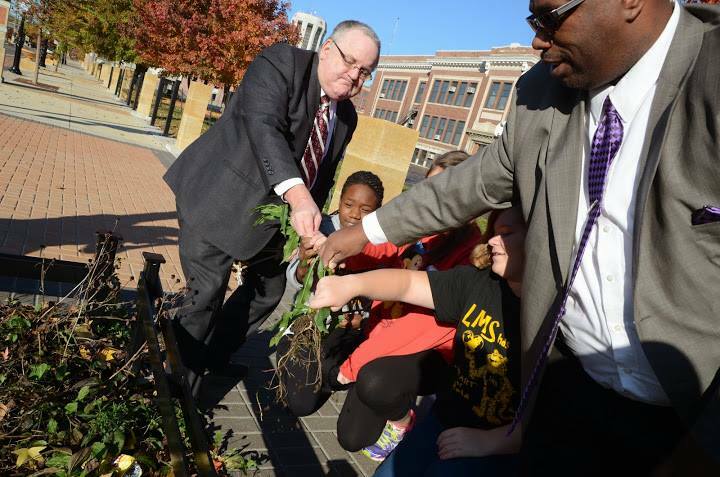 To date, over 60,000 packs to the schools, churches, and community gardens including Springfield, Illinois District 186, Clarke County School District in Las Vegas, Gateway Greening in St. Louis, U.S. Diplomatic Mission in Berlin, Growing Power Chicago, New York Restoration Project, and others. Kids learn that when they grab on weeds of hatred together and root them out, weed out racism becomes easier, leaving room to sow the seeds of sunflower peace.